Barh or Banyan, a remarkable tree of India and tropical Africa sends down from its branches great numbers of shoots, which take root and become new trunks. A single tree thus may spread over a large area and look like a small forest. 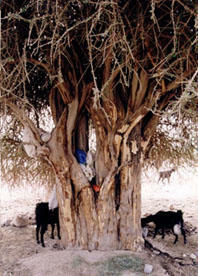 This tree is considered to be sacred in some places in India. A specimen in the Calcutta botanical garden is more than 100 years old. It has a main trunk 13 feet (4 m) in diameter, 230 trunks as large as oak trees, and more than 3,000 smaller ones. The largest banyan tree known is on the island of Sri Lanka. It has 350 large trunks and over 3,000 small ones. The banyan often grows to a height of over 21 meters and lives through many ages. Barh tree has large leaves and small blossoms followed by cherry like scarlet fruit which furnishes food for birds and monkeys. A fruit, much like the edible fig, grows on the banyan tree, but it is not good to eat. The wood of the banyan tree is soft and porous. Its white, sticky latex is used to prepare birdlime, which hunters use in capturing birds. Barh tree grows in a peculiar way. Birds drop its seeds into the top branches of other trees. The seeds sprout in the treetops and the Barh tree begins life as an epiphyte on the host tree, gathering its nourishment and water from the air and branches develop. Eventually, the lateral branches send roots down to the ground. These supports then enlarge into trunks and develop new branches. In time, the Barh kills the host tree by strangling it. The mature Barh's canopy may cover an area more than 1,000 feet in diameter. The stems below the canopy form a kind of columned room. Its original trunk may decay, leaving the younger ones to support the tree. In Hindu mythology, the banyan tree is also called kalpavriksha meaning 'wish fulfilling tree'. It represents eternal life because of its seemingly ever-expanding branches and people have great respect for it. There are many stories about it in ancient literature. The banyan tree is named after 'banyans' or 'banians', the Hindu traders seen resting or carrying out their business under the tree. In fact banyans have become important meeting places for many people who gather in its shade to relax or chat. Banyan twigs are sold in Asian markets as tooth cleaners. The tree represents eternal life because it supports its expanding canopy by growing special roots from its branches. These roots hang down and act as props over an ever widening circle, reflecting the Sanskrit name bahupada, meaning 'one with many feet'. In Hinduism the banyan tree represents immortality and there are many stories about it in ancient literature. In a song called the 'Bhagavad Gita' or 'Song of the Lord', Krishna uses the banyan tree as a symbol to describe the true meaning of life to the warrior hero Arjuna. Banyan is viewed by Hindus as the male plant to the closely related peepul or bodhi tree (Ficus religiosa). It is regarded as a sin to destroy either of these trees. It is commendable for a person to plant a young banyan close to a peepul, and this is done with a ceremony similar to that of marriage. It is customary to place a piece of silver money under the roots of the young banyan. 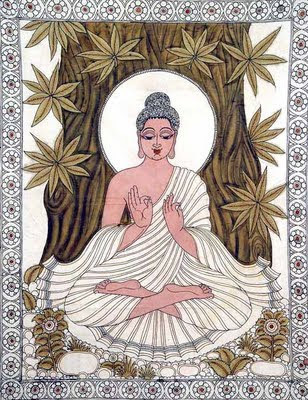 Banyan is mentioned in the Buddhist Jataka tales. In the tale of Satyavan and Savitri, Satyavan lost his life beneath the branches of a banyan. Savitri courageously entered into a debate with Yama, the God of Death, and won his life back. In memory of this couple, in the month of Jyestha during May and June, the tree is celebrated. Married women visit a banyan and pray for the long life of their husbands. Minor deities such as yakshas (tree spirits), Kinnaras (half-human, half-animal) and gandharvas (celestial musicians) are believed to dwell in the branches on banyan trees. Ghosts and demons are also associated with its branches. Because it is believed that many spirits are harboured in the banyan, people do not sleep under it at night. Many years ago, in fact so many years that no one remembers if it was hundreds or thousands of years or even longer, a group of village wise men had a debate on the merits of the Banyan Tree. "This tree," the first man said, "its wood won't burn, it can't be used to make a fire. ""We can't make tools from it either," said another. "The wood is too porous. ""The fruit is dry, too bitter to eat," complained the fat one. "And just see how big it is! Takes up too much space in the village," they went on and on. "For man," they insisted, "this tree is absolutely useless!" Then the wisest of the wise men pondered over the question.At last he said, "It seems to me that this useless Banyan tree must be a very special tree. If it is absolutely useless for man - then it must have been created for the Gods!" "Ah ah! Ama! True wisdom! No problem!" they all agreed.And ever since that day the Banyan Tree has been sacred and taken care of for the Gods. But? Where are the flowers? Has anyone ever seen one? When was it summer or monsoon time? Do you remember if the flowers were yellow? Red? Purple with green spots? Pink? We do know the tree has fruit; little balls that look like ripe cherries. They grow in pairs along the leaf axils. During fruiting season the tree is filled with hundreds of birds. We know that all fruit must have a blossom - or do they? Sometimes the Banyan fig is called a fruit without a flower. This is nonsense of course. But- where are the blossoms? You will need better eyes than even our Shikra hawk to find a Banyan flower. That's because they are hidden inside the fig. The blossoms are very small and hundreds of them spend their entire lives inside the fig. The flowers have a unique friend called a fig wasp. Each kind of Ficus (fig tree) has its own special species of wasp attached to it. The wasp's job is to pollinate the fig flowers. The wasp enters the fig through a natural hole in the top and lays its eggs. When the insects hatch and leave their home they become covered with pollen. Then they make their way into another fig and fertilize its blossoms, making sure it will produce seeds. Banyan tree near the Dead Sea local name ''Zeyton Maskhout'' The Banyan trees in ancient Arabia served as places for holding council and negotiating treaties. This same tree is revered as tree justice amoung many cultures. "There is in India a tree whose property it is to plant itself. It spreads out mighty arms to the earth, where in the space of a single year the arms take root and put forth anew." Pliny (A.D. 70). Three thousand years before Pliny described it to the Roman Empire this mighty shade tree struck awe in the Aryan nomads sweeping across Asia. Their priests linked the banyan's outpouring of vitality to a flow of light or to a liquid immortality overflowing onto the earth from the goblets of the gods themselves. Their chiefs drank ritually of its sap, believing it could increase their virility and ensure their hold upon conquered lands. 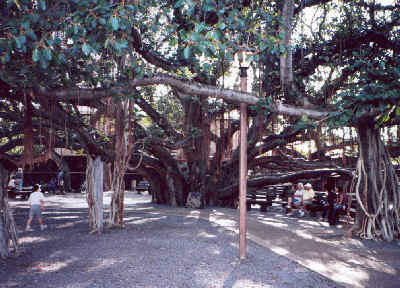 I remember well wandering under this huge tree in Maui. It seemed eternity had been given a shape here. here are many banyan trees in khajuraho. hindus worship banyan tree .the reason is that now scientist have found a chemical in the juice of a banyan tree which opens third eye. my feeling that buddha got enlightened because he was sitting and meditating under a banyan tree. Theosophical Society Gardens, Chennai, India, has a 100 year old Banyan tree standing majestically in their premises - this haiku is in remembrance of that banyan tree! this sounds lovely, brett !